So I wrote this post yesterday, and today we tried it out. The purpose was to give students an opportunity to notice the subtleties in the language associated with three different mathematical scenarios they may need to represent. We read each scenario out loud and then asked the students to compare and contrast each problem type with their table partner. Others began by making a list of what they noticed on the back…You can see that this student paid attention to more of the mathy parts~understanding what was meant by a one-variable versus a two variable equation. And then you’ll see below where students were able to make sense of each scenario and the math required. However, the first student used an equation in two variables for the first scenario and created a table to find the solution. We didn’t get to the whole class conversation part of this lesson…I want to talk about each problem type and how to recognize the differences. 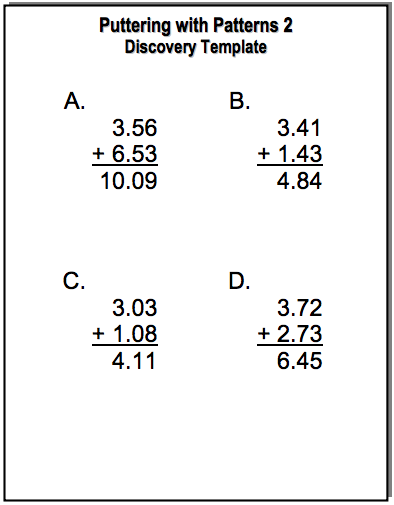 Notice that two of the students above wrote the equation for the two variable scenario, but the third student created a table. I think we need to talk about why that is. Also, I think I may want to do three more scenarios that would produce equations in standard form, to see if they would recognize the differences then. I definitely think that this was a useful exercise and would do it again. One little shout out…one student pulled out their phone because they wanted to check out the equations for the third scenario on their Desmos app!!! I worked as the math teacher in a k-21 special education facility at the time and immediately understood the benefit of posing problems like this to students with special needs…EVERYONE can notice something meaningful to contribute. I’ve been out of the classroom for many years, but this year have returned to lesson plan for an 8th grade classroom that is being taught by a long term sub (the teacher moved out of state in October). I’ve been in this classroom more often than not–co-teaching with the sub. This has been my opportunity to really try out many of the activities that I have come across on Twitter–YAY!!! When @MaryBourassa created the new site “Which One Doesn’t Belong?”, I was excited that she brought this type of problem to the forefront AND gave it a more secondary sort of spin. A good portion of the students in these 8th grade classes that I am working with are reluctant learners. But, #WODB pulled them all in. 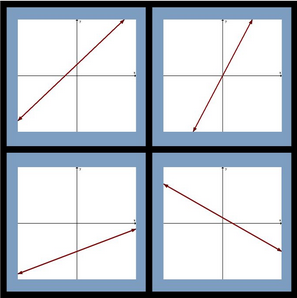 Fo the #WODB task, my students noticed that the 2nd graph was proportional, that the 3rd graph had a negative y-intercept, and that the 4th graph had a negative slope. We needed to have a classroom discussion to determine an attribute for the first graph that didn’t fit in with the rest. We ended up talking about x-intercept for that one (a term that they didn’t have yet). All of these observations became questions they asked when playing Polygraphs. I’m looking forward to making the #WODB problems a larger part of our typical daily routine.